Gilgit is just off the Karakoram Highway between Chilas and Karimabad, and most people arrive by road. The journey from Islamabad can take as long as 24 hours. The best season to visit is from May to mid October. The local dialect is Shina, however, Urdu and English are also spoken and understood. 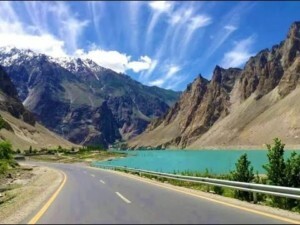 Hunza was formerly a princely state, bordering China to the north-east and Pamir to its northwest, which survived until 1974, when it was dissolved by Zulfikar Ali Bhutto. The state bordered the Gilgit Agency to the south, the former princely state of Nagar to the east. The state capital was the town of Baltit (also known as Karimabad) and its old settlement is Ganish Village. Hunza Valley is situated at an elevation of 2,438 meters. The tourist season is from May to October. The temperature in May is maximum 27°C and minimum 14°C. The October temperatures are: maximum 10°C and minimum 0°C. Day 1 Drive to Chilas, transfer to the hotel. Day 2 Drive to Hunza. Afternoon free at leisure. Day 3 Sightseeing in Hunza. Day 4 Drive to Gilgit and visit Bazaar. Day 5 Drive to Besham for overnight.